Today is the kind of day you seize with both hands. Right now, the fossil fuel industry is on the defensive and fighting back — that’s because our Fossil Free movement has truly hit its stride. Thousands of us across the planet are taking a stand today and tomorrow to end the age of fossil fuels — because that’s what it really means to solve the climate crisis. The Hollywood forest transformation project shapes not only my long term eco art project. It influences how we live with the forest here and how we think about wider eco-social issues. 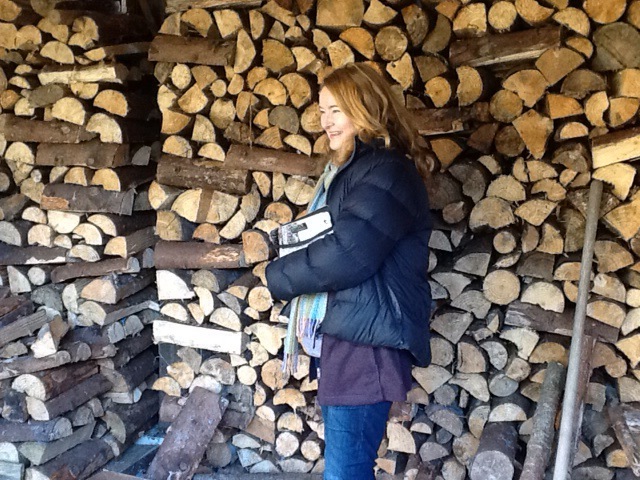 From our 2.5 acres we get an astonishing 70 tonnes of firewood every three years – Hollywood is such a clever young forest!! We’ve long wanted to move away from oil that heats our home; for the misery it causes people and other species in countries far away and because of the unfolding and accelerating calamity that is climate change. It is easier said than done in Ireland, where we are only re-establishing our forests and where most homes rely on imported heating oil from war-torn countries. has a small separate room to house a wood burner (gasifier). The latter item took more saving but it is being installed today. Everyone is coming to terms with the necessity of “breaking-up” with fossil fuels!! So enjoy the wonderfully humorous video made by students below. Please share and tag this post #divest to raise awareness and help get this generation to abandon fossil fuels.